With the doubleheader sweep, Austin Peay (14-10, 5-3 OVC) was handed its first series loss of 2018, snapping its season-opening streak of five weekend series wins. Tennessee Tech (17-5, 7-1 OVC) solidified its spot atop the OVC standings and claimed its third-straight OVC series victory. The day’s first game was a pitcher’s duel between Austin Peay starter Michael Costanzo and Tennessee Tech starter Travis Moths. Costanzo would surrender the game’s first run when first baseman Chase Chambers led off the fourth inning with a home run. It was the only run Costanzo would allow in his six-inning outing. Moths held the Governors in check throughout his seven innings, striking out nine while scattering three hits. Reliever Ethan Roberts would strikeout four in his two innings of work as the Golden Eagles duo handed Austin Peay its fourth shutout loss this season. Costanzo (4-1) suffered his season’s first loss despite holding TTU to one run on five hits in six innings. Second baseman Garrett Giovannelli had the Govs’ lone multi-hit outing, going 2-for-4 to pace a five-hit attack. Chambers added a bases-clearing double in the seventh to cap his 3-for-4, four RBI outing. Catcher Brennon Kaleiwahea chipped in a 2-for-4 effort as the Golden Eagles won despite being held to eight hits. First baseman Parker Phillips had the Governors first five RBI in the nightcap, including a three-run home run that tied the game 5-5 in the fifth inning. It capped a rally that saw Austin Peay recover from a 5-2 deficit after Tennessee Tech got two-run home runs from designated hitter Kevin Strohschein and second baseman John Ham in the first and third innings, respectively. Tennessee Tech immediately broke the tie in its half of the fifth with two runs then broke the game open with a seven-run sixth inning. Third baseman Trevor Putzig and shortstop David Garza each had two-run hits in the Golden Eagles sixth inning as they jumped out to a 14-5 lead. 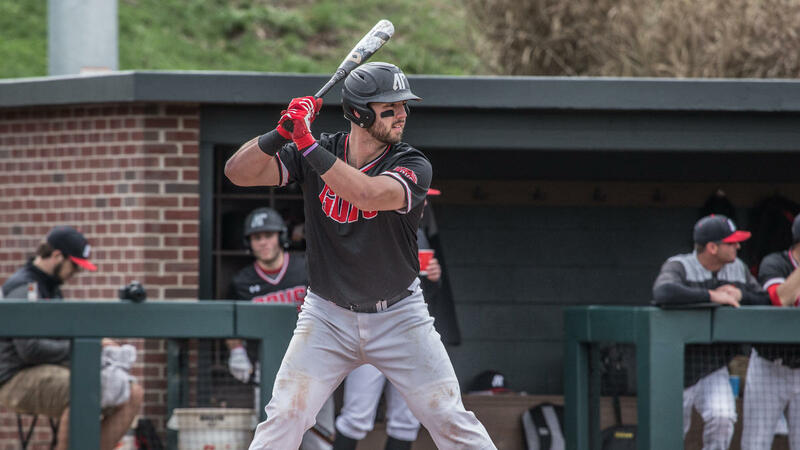 Austin Peay got a big chunk of that deficit back in the seventh inning when they strung together four consecutive hits to drive in four runs. Phillips would added a RBI single to his work in the nightcap as part of the rally as the Govs closed to within 14-9. After Tennessee Tech added a run in its half of the seventh, Austin Peay would narrow the gap further in the eighth. Four consecutive batters walked with catcher Alex Sala‘s base on balls pushing in a run. Left fielder Kyle Wilson then tacked on two runs with a single and the Govs closed to within 15-12. The Governors would bring the tying run to the plate in the ninth as they got two aboard courtesy a hit batsman and a walk. But reliever Tyler Sylvester induced a ground out to end the game to notch his season’s first save. Austin Peay starter Jacques Pucheu (3-1) suffered his season’s first loss after allowing seven runs (five earned) in 4.1 innings. Phillips went 3-for-4 with five RBI, including a double and a home run to pace the Govs offense. Golden Eagles reliever Colton Provey (2-0) picked up the win after replacing starter Marcus Evey, who was lifted after pitching just 4.2 innings. Ham and Garza each had two hits and three RBI to pace the TTU offense.